When I think of five wardrobe essentials, thoughtful accessories always come to mind. One of my favorites is a good, trusty handbag like my cabernet bucket bag from Madewell. This particular one is now out of stock but here are some other gorgeous color options in the same style. Madewell bags are some of my favorites, including their transport tote. I've had mine going on three years and it's still in gorgeous condition and only improves with age. Speaking of accessories, a classic watch is one of my favorite fashion statements. This one from Fossil pairs perfectly with my fall wardrobe of chunky knit sweaters and my new found love of olive green and rust colors. I adore the rose gold and love that it is a smartwatch but maintains a timeless elegance. I'm a complete sucker for a unique, stylish shoe. When I found my new favorite shoe on Moorea Seal I just had to order them right away. I heard they sold out quickly but if you'd like the original that they are patterned after than check out Free People's Royale Flat. I still love my ankle boots but I believe these flats are going to be a fall staple...and if we are being honest, a year-around one at that. Anyone that has followed my blog and Instagram knows that I adore thrifting. I love picking up second-hand and vintage pieces to add to my wardrobe. Simple dresses are some of my favorite things to wear. The rust colored cotton dress pictured above is handmade and fits me like a glove. It was a very happy thrifting day for me when I scored her! Another thrifted top and dress that I love. Thrifting is one of my favorite ways to shop because I am saving money, being resourceful, and am going to be wearing a unique dress or outfit that more than likely, I won't spot on anyone else. I'm all about uniqueness and individuality. Those one-of-a-kind pieces are truly the best. As I sit here typing away and watching Felicity, ( a new favorite fall activity), I can't help but include a cozy cardigan in my top five wardrobe essentials. In my opinion, Urban Outfitters has the BEST sweaters to curl up in and keep warm on a cool, crisp fall day. I just ordered a couple for myself in different colors. I have a feeling that I'll be living in them all autumn and winter. I also love shopping second-hand for cardigans as well! One of my absolute favorites (pictured above) is a thrift find! I hope you enjoyed browsing my favorite fall wardrobe essentials! 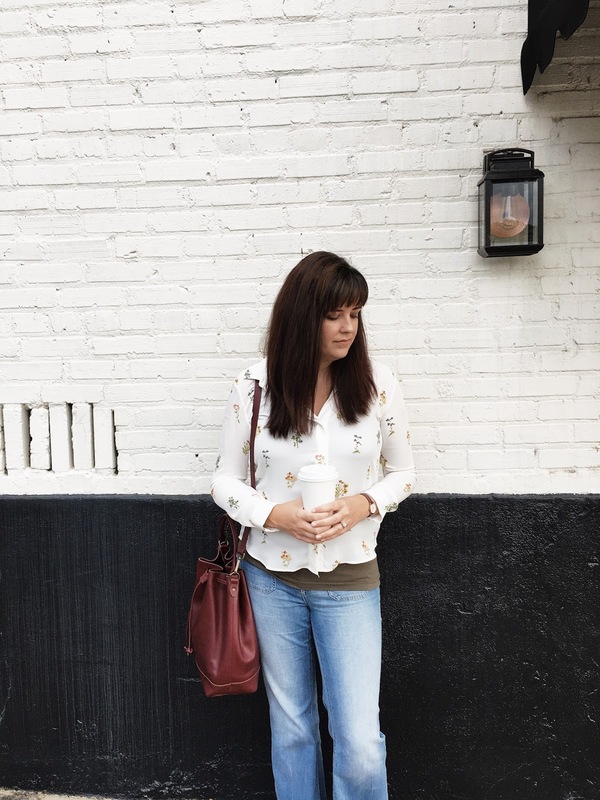 My friend Lauren has a blog (Chic Ethique) and is sharing her favorites and those of other bloggers (myself included) every week so hop on over there for more autumn clothing inspiration!